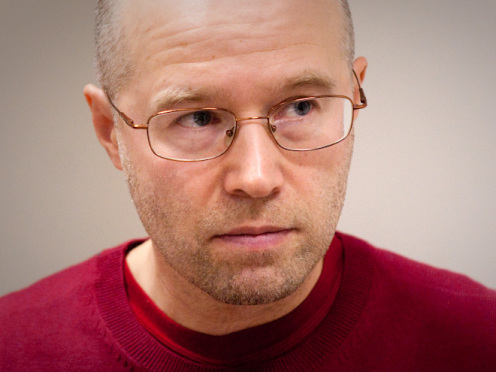 Konstantin Bronzit is the key person and anchor of present-day Russian animation. Twice nominated for an Oscar for “Best Animated Film”, and the winner of numerous awards at international festivals, Bronzit has displayed incredible fortitude as well as fidelity to the profession for many years; he shot his films in spite of the quite trying circumstances of an artist’s life in the Russian film industry. Despite growing a sense of skepticism over the years, he has, nevertheless, not lost faith in the power of human relationships, which are indispensable for professional survival. The irony that characterizes Bronzit’s attitude towards his characters, whether animals or people, allows us to consider his films not only as fabulous miniatures, but as narratives of the paradoxes of life that are universal for any community. We had the opportunity to talk to Bronzit immediately after his return from the 2016 Academy Awards ceremony. This is the second time that he has lost out on an Oscar. He has many admirers in Russia, but investments in advertising, and promotion of his movie in the film market – both of which are necessary in the context of the globalized environment – were minimal; and this was unfortunate for the film. Bronzit has repeatedly said this in Russian-language social networks. Nevertheless, the conversation was interesting and instructive for us, and a criticizing pathos, which is so noticeable in his films, isn't all that inconsistent with the creative tasks that the subject of our interview sets before himself. His vision of his own future in animation is devoid of false illusions, and yet he continues to search for new solutions, and most importantly, to dream. What are your impressions of the trip to the ceremony? Is it the trip or the ceremony you are asking about? This time we drove to the ceremony “properly”, in a big white limousine. It was definitely not what we had back in 2009, which was a decrepit old Buick; and just imagine, one of the rear doors refused to open. We motored merrily, making jokes and quips. Compared to the 2009 ceremony, this one, frankly, was a damp pastiche in all respects. Back then, Hugh Jackman hosted the evening; he's a singer, dancer and showman… and he knew how to do that – how to be a host. This year the Academy invited Chris Rock, a comedian. So, it was definitely a failure in terms of casting. He had nothing to offer to the public besides mere declamation. And his joke about the “blacks’ boycott” of the ceremony was clearly dragged out. In 2009, all five songs that were nominated for the Oscar were performed live. This year, only two of the songs were performed live for the audience. Not to mention the amazing number of stars per square meter that could be found both in the hall and in the foyer of the Kodak Cinema back in 2009. This year, of course, DiCaprio and Stallone sat in the front row. However, you had to literally keep your eyes peeled at all times to make sure that you were at the Oscars, in the famous “Kodak”, and not among some shady riffraff at a concert in the Kremlin Palace of Congresses. During all of the Oscar hype, you said a few times on Facebook and in the media that it’s not possible to win an Oscar by simply making a good movie. You have to have a PR company and be supported financially. Did anyone help you? That’s a difficult question. I don’t even know if it’s worth talking about. I’ll have to explain too many things then. But to make it short, Ekaterina Mtsuturidze, who is the head of Roskino (the government-funded organization for the promotion of Russian cinema worldwide), responded first. So, Roskino and Aeroflot Airlines sponsored our flight to the USA and back to Russia, which was a kind of help we didn’t really expect. It didn’t work out with the film though. The “hype” was a bit late. Ekaterina Mtsuturidze did her best; she couldn’t do more. And the people in charge of PR campaigns were too reluctant to help, or too busy doing something else... I don’t know. So, there was no information on the film in the US press. This is the kind of PR campaign I’m talking about, and it does cost a lot. I’m just the director of a short animated film. I can’t afford such expenses. I wonder why Chile did its PR campaign for the animated film “Bear Story”. I had a chance to look through an issue of Animation Magazine right before the final voting of the Oscar Academy members. Its back cover was all dedicated to “Bear Story”, which won the Oscar in the end. You’ve been nominated for the Oscar twice: the first time for “Lavatory Lovestory” (2006), and the second time for “We Can't Live Without the Cosmos” (2014). The first film is about love, the second is about friendship; it might mean that you’re very romantic deep inside, despite your brilliant sense of humor. However, the first film has a happy ending, but the second one ends tragically. Did your view of life change over that period of time? If so, why? It’s true that the worldwide recognition that you’ve gained can be in no way compared to that of other Russian animators. I have to say that there’s absolutely no connection between what I do as a professional and the way I feel about things. This is all about “something else”. I finished “Lavatory Lovestory” in 2006, and “We Can't Live Without the Cosmos” was made in 2014. There was a long period of time between these two films. Surely, with time I become more mature both physically and mentally, so I do change. Any artist can experience that in their work. It’s when the way they view things changes with time, or the themes become deeper for them. You have to set yourself tougher goals. It’s hard. You have to be much more committed and dedicated than before. And the only thing that does frighten me is that I might not be able to handle this pressure one day. When that moment comes, one might have to leave the profession, but surely that will not be your story. For you, animation is the same as space is for your characters. You can’t live without it. In “We Can't Live Without the Cosmos” you appear to be a tough critic of what’s going on in Russia nowadays. Your characters dream of flying to outer space. They train and support each other. They are oppressed by their chief, but they’re still very romantic in their hearts. 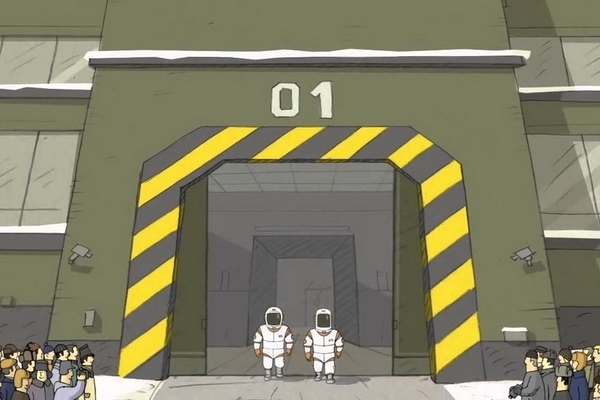 But when one cosmonaut dies during the flight, the other becomes incapable of communicating. You make it clear that a dream can unite people, but you also show how dreams can be dashed against the primitive ways of making them come true. Taken like this, your film can be considered as being critical in both a social and political way. We all know that rockets crash in Russia; a rocket crashes in your film. Why did you made such a daring and straightforward statement? It’s funny that you think I’m not going to quit making animated films. That’s exactly what I’m thinking about at the moment. Animation isn’t something that makes me keep going. It’s been like this for a long period of time. Believe me, I can live without it! My life will definitely become more quiet and peaceful. I’ll tell you more: I even think that this is the last film in my professional career. But let’s get back to what I was saying before. If one keeps setting tougher goals for oneself, and then spends years trying to make them happen, then I can hardly imagine when my next film will be released. What’s more – does it have to be made at all? This is something that makes me different from many film directors, especially from those who make feature films and truly think that they're making everyone happy with what they do. As far as your question is concerned, I can say that it shows exactly what I mean. Is it really worth saying anything if they “get” you wrongly? Or, I might have failed to learn how to speak the language of the cinema. That’s quite possible. Actually, I didn’t mean to criticize any social or political issues. I meant to say something different in my film. I don’t care about those rockets that crash. It’s a tragedy when people die due to someone’s negligence or simply by accident. You know, there are many more car crashes [than rocket crashes] in the world. My film is about a kind of affection between people that doesn’t really exist. It’s a fairy-tale, a fiction. But in this fiction, I reveal my longing for the rare examples of such relationships between people in real life. You won’t give up so easily (although you might be thinking about it). Criticism of social and political issues doesn’t mean we can’t discuss how strong relationships between people can be. In Russia, these relationships are particularly important as they represent the only social-language refuge in a life that is full of chaos and violence. In this respect, your film presents itself as Russian – through its sheer spirit – on the one side, and on the other, it tells the viewer a universal story. 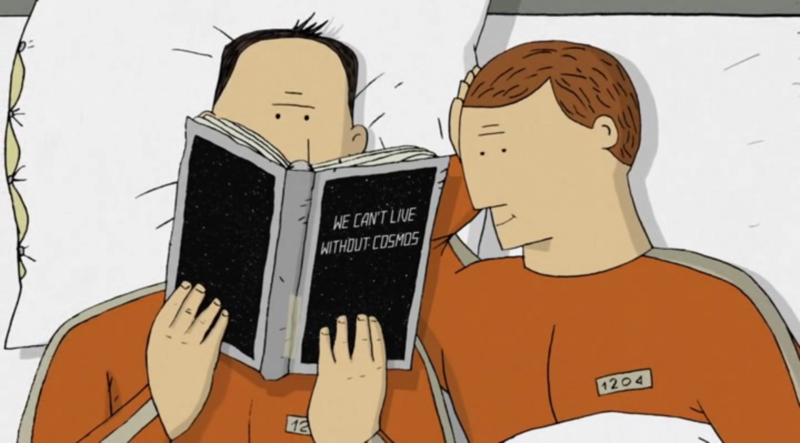 The world in which your cosmonauts live is quite a harsh one. There’s nothing romantic in it. The romantic side lies in outer space, which is represented by contrasts: the abyss of space confronts the routine and squalid everyday life that the cosmonauts lead. You turn out to be someone who tends to think about the squalor of life. “Lavatory Lovestory” tells the story of a woman who works in a men’s restroom. In this film, one can easily see how this could be the only dimension of life she sees in an everyday life that is poor in details. But in contrast, she sees petals in such a shade of red that it gives her hope for happiness and love. What do you dream of, if we put animation aside? You’re right. One can’t help thinking about the squalor of everyday life. In Russia, you see it everywhere. Some patriots might boil over with anger: “It’s not true what he’s saying!” I suggest they leave their flats and go down to the entryway. It is this spot, the entryways of Russian apartment complexes, that brings the argument to an end. It’s in these houses, on these walls that we see our culture, not in the Hermitage or in a novel by Dostoyevsky on your bookshelf. The answer is clear. I have a dream that our grandchildren (our children have already failed at it) will be able to smell flowers in entryways and elevators, and not some stench coming from the corner. This clearly shows what’s happening on a larger scale in our country. Nevertheless, the most important thing is that you are an artist who has a lively imagination and an equally rich sense of humor. Your famous film “On the Edge of the Earth” (1998), which has won 60 international awards, including a special jury prize at the festival in Annecy, lambently rethinks the poverty-stricken life of characters who live in a wretched house hanging by a single thread. With each gust of wind and each movement by its inhabitants, the house on the hill is about to collapse. It remains standing only because the old woman who lives in it makes every effort to drag all of the others inside the house: her old husband, her dog, her cat, her cow... You showed perfectly how a woman can protect her home against all odds; how comical it might look from outside, but how, nevertheless, it contributes to the maintaining of life itself. The miserable conditions of existence in which we find your characters do not rule out the warm and vivid colors with which you depict them. And your delicate and sympathetic irony enables us to look at the situation as a paradox of life. After all, both possible choices of action are viable: either escape from the house and head for freedom, or try to repair the house and save its inhabitants. Clearly, you were much younger then and believed that your best films were yet to come. Now you have twice been nominated for an Oscar and have made a number of first-class films. Why then, do you feel that you have come to the end? Did I say that this is the end? What compulsory reason is there for me to spout out films with such regularity, as if I were mad? Is this the purpose of my life? It is exactly the opposite that is true. It's time to break free from the yokes of art. At the moment, my head is a vacuum; completely done, no ideas. An idea… it’s like a foreign object in the body. If showed itself, it sickens the life out, and surgery is required. However, today nothing disturbs my life or, to put it discreetly, it does nоt, at least, for the time being, because the appearance of these damn ideas is out of control. I feel very well. There is still time to see my children grow up, to catch those last precious moments. Very soon everything will change irrevocably. Cinema is not supposed to devour human life. By contrast, if you join in with the film production process, all the world would begin to rotate around it. I can’t make it any other way. And also, film making is a mid-life profession. You should enter into it at the right time (i.e., not too early) and leave it betimes (i.e., not too late). One must try to avoid a situation that would require your life to be scaled down to the scope of your movie, and your movie to be scaled up to the scope of your life. That's a core objective. And it's high time to start learning how to achieve it. And yet, has your latest breakthrough made an impact on your future career? Are there any proposals to work abroad? Have you received any offers of cooperation from Russian producers? Sometimes this question is asked more bluntly: will the Oscars change your life? The answer is no. No way. Just in the sense that, over the next three months, my phone will ring more often. I'm going to go to the same job and receive the same salary. But I tell myself this: a person's life shouldn’t depend on some figurines or awards – not a single one. The quality of a person's life should depend on him alone. We hope the quality of your life is ОК. At least, for now. We are doing this interview on your way to Japan. What are you going to do there? In Japan I'll be on the jury at the TOKYO ANIME AWARD FESTIVAL. Last year, I got the Grand Prix for my “Space…”. I couldn’t attend the festival at that time, and they invited me this year in the capacity of a judge. I’ve never been to Japan, so I couldn't refuse such an offer.